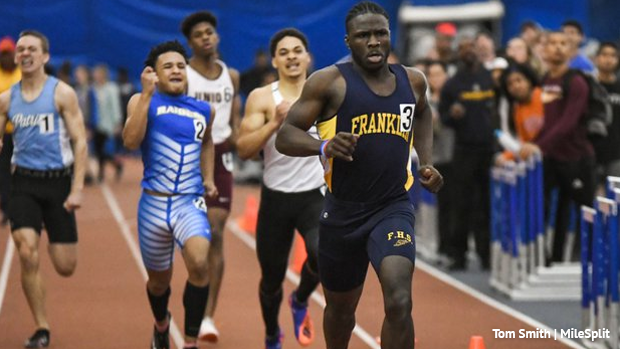 Here are the boys MileSplit New Jersey All-State teams for the 2019 indoor track and field season. Remember these teams are open to all of our New Jersey athletes in high school. So while the NJSIAA state championships will still hold some weight these teams aren't restricted to them. Season of work with anything major at Nationals included, quality and consistency of performances, head to head match-ups, key victories and so on will make sure our very best high school stars in New Jersey make the cut. 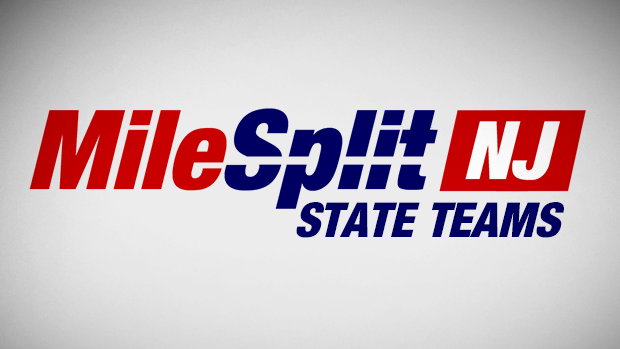 For the first through third teams an athlete will be listed once even if they did great work in multiple events, freshmen who make the first three teams will still be listed as part of the freshmen team. The junior who ended Heslop's bid to win three events at the Meet of Champions, Louis Akpadago of Nottingham. Five wins on the season including a Group state title and the Meet of Champions Akpadago finished the season with a PR of 6.38 and returns next year to defend his title. Sincere Rhea closed out an amazing season in the hurdles winning the 60m hurdle championship at New Balance Nationals Indoor with a 7.69, just .06 off the state record held by Cory Poole! 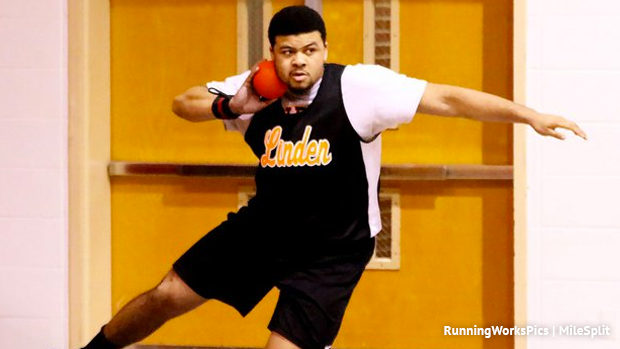 His 55m en route time was a 7.16 which also improved his NJ top five all-time ranking. Mario Heslop dominated the state in multiple sprinting events this season, it was almost hard to choose which event to place him on but we went with his monster state record setting 200m that brought home a National Championship. 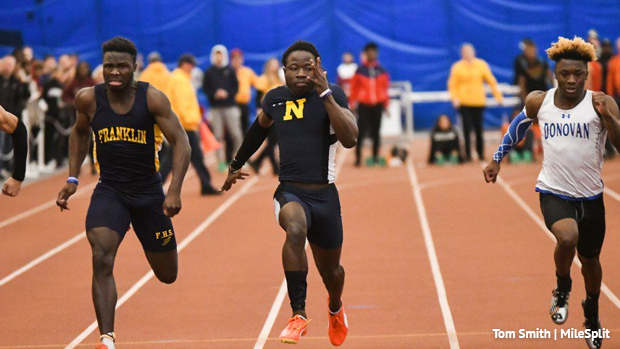 This season Heslop posted a 6.26 in 55m and 6.70 in 60m which both tie the state record, in the 200m his 20.90 not only set the state record but moved him up to US#4 all-time indoors, he also led the state in the 400m with a 49.23. Zachariah Murray took off this year winning a Group state title and his first Meet of Champions victory as well. He closed out the season strong running a PR of 49.24 for fourth in the Emerging Elite at New Balance Nationals Indoor. His best indoor time coming into this season was a 51.43 from 2017. It's been a long road to get here, see the in depth story from Courier Post's Josh Friedman which went over Murray's battle with cancer before becoming the track star he is now. 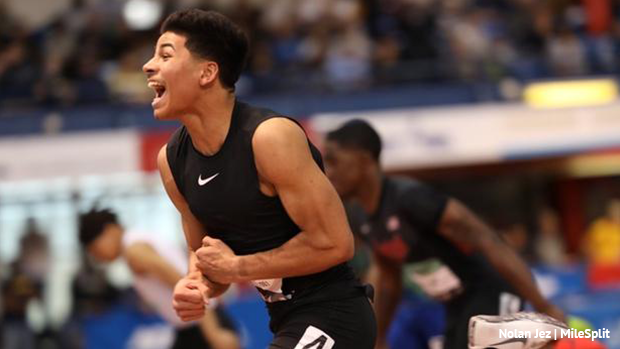 While Luis Peralta, the 2018 Meet of Champions winner in the 800m, skipped the state tournament this year he still put down a solid resume of performances elsewhere. 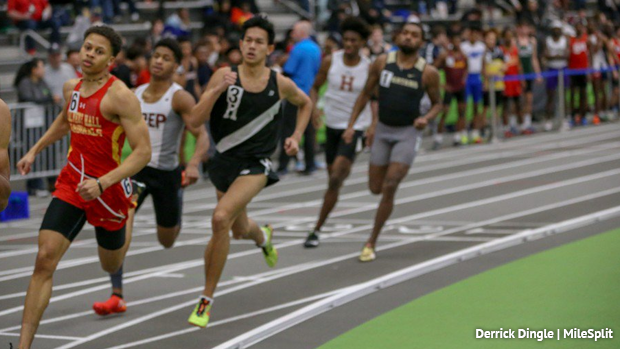 At the Dr. Sander Columbia Challenge in January he ran a NJ#3 all-time 1K performance of 2:24.53, he also blasted a 1:19.14 time in the 600m at the New Balance Games, and then finished the season with a silver medal at New Balance Nationals indoor in the 800m running 1:52.30. Ten victories in total between all of his events. 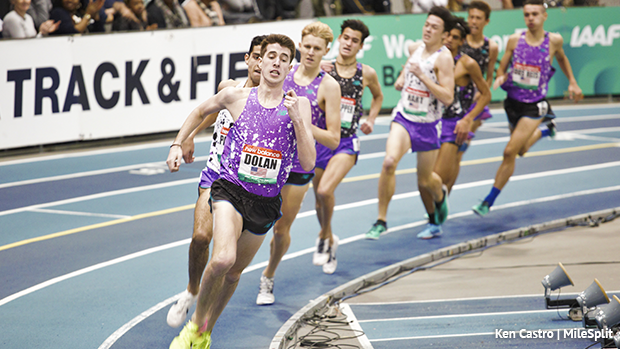 While Sean Dolan's season was cut short due to injury the times he did race he sure made them count. 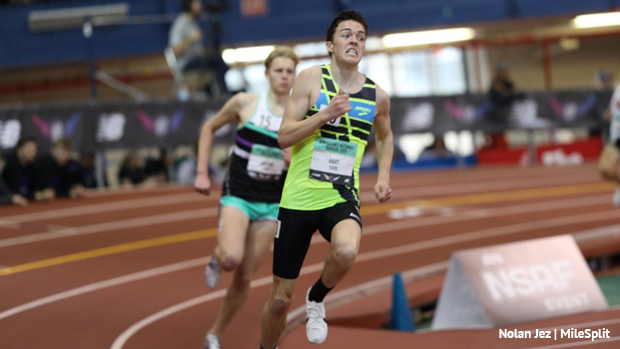 He ran two 4:09s in the mile just a week apart, including his 4:09.55 third place finish at the Millrose Games which puts him NJ#4 all-time indoors. Also in that race? Will Baginski in 12th at 4:17.49, Baginski brought home five 1600m victories this season including his 4:12.90 win at the NJSIAA Meet of Champions and a Group state title. This was one great season for the two mile as well and saw one of the greatest races in state history go down at the Meet of Champions. Devin Hart is our pick here as his multiple sub-9 performances and National Championship sealed the deal. After Hart opened state season strong with an 8:59.32 at Sectionals he entered the Meet of Champions as the clear favorite going for his sixth Meet of Champions title. Well Liam Murphy had something to say about it and they battled all the way to the line where Murphy clinched his first MOCs title running 8:54.22 to Hart's 8:54.45. At the time these were the #2 and #3 fastest times in state history indoors. 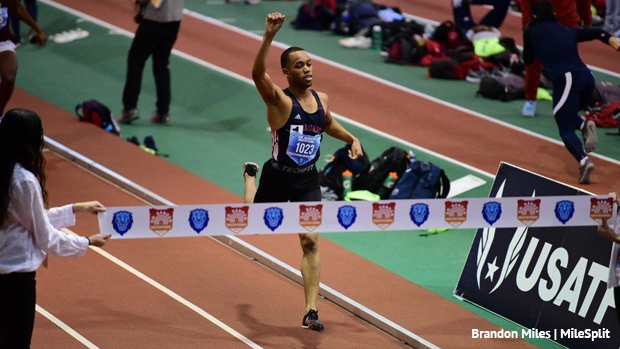 Two weeks later at New Balance Nationals Indoor Hart didn't go down with the loss from MOCs, he stepped up and ran his way to a National Championship running 8:56.89 over two miles which converts to an 8:53.78 3200m, the new NJ#2 all-time performance. 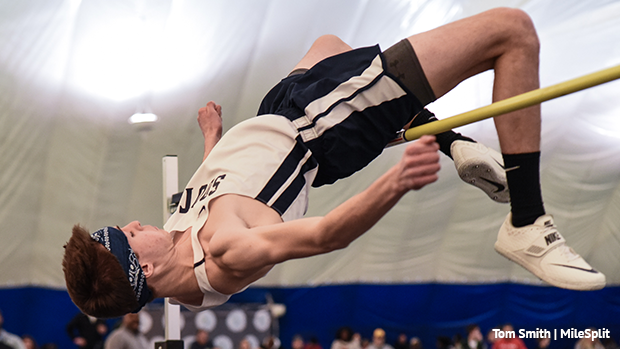 Mark Anselmi was a machine in the high jump this year winning nine straight until he was third at New Balance Nationals Indoor for All-American. Finished the season strong with a 6-08 clearance to win MOCs and then tied his PR at New Balance Nationals with a 6-09 bar. This was one historic season for the pole vault. We didn't have enough teams for the amount of guys who deserved it and moved up the all-time list this year. Liam Landau, Bradley Jelmert, Simon Schenk, and Nico Morales all moved into the top ten all-time indoors for New Jersey. 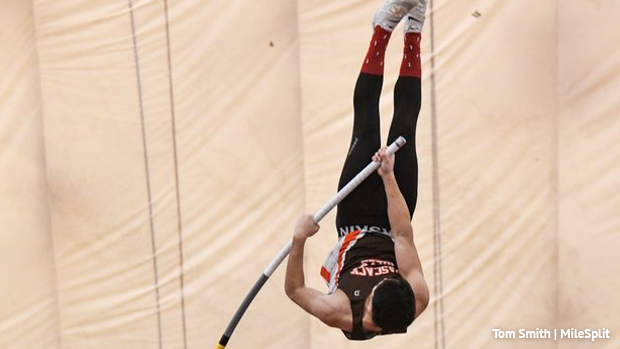 Landau cleared a 15-09 in January and brought home eight victories in the vault this season including a Group state title, Meet of Champions victory, and a title at Eastern State Championships. Kyle Lipscomb delivered 11 wins on the season including a Group state title and Eastern States Championships. Was second at the Meet of Champions to Brendan Loftus and then eighth at New Balance Nationals Indoor with a PR mark of 59-07.75. Just one of the stories of resilience this season. Nils Wildberg was set for a big season in the long jump and opened up with a 23-04.5 in December. Unfortunately that was derailed when he suffered a meniscus injury that held him out most of the season. When he came back in February he did so in fashion hitting a 23-04.5 to win Eastern States Championships. 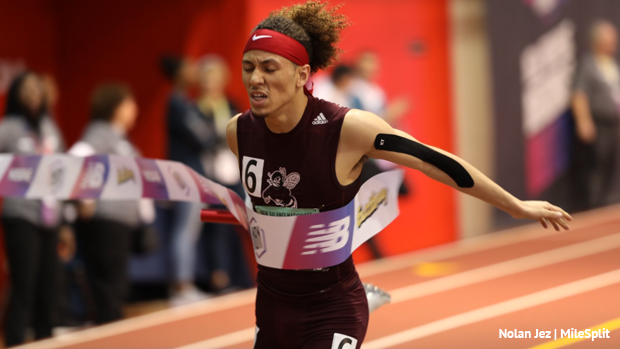 St. Benedict's Prep had the three fastest times of the season running 3:21.18 to win Millrose Trials in January, a 3:19.48 at the Boston University Last Chance meet in February, and then a 3:18.36 to win a National Championship at New Balance Nationals Indoor. Their squad was made up of Lewis Ngwenya, 49.34, Jackson Burnett, 50.411, Alfred Chawonza, 49.58, and Isaiah Sanchez, 49.03. 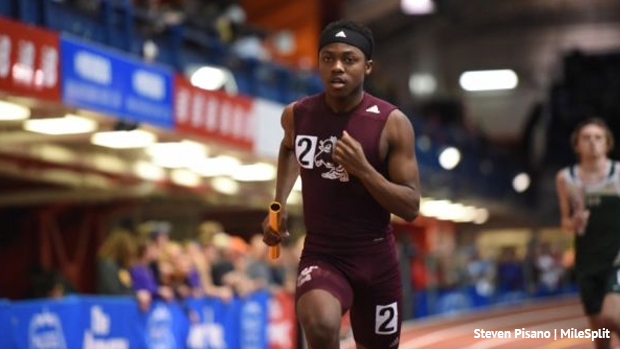 Just one of their many All-American status performances at New Balance Nationals Indoor the St. Benedict's Prep boys ran to third with a 7:42.53, just a second off the state record. 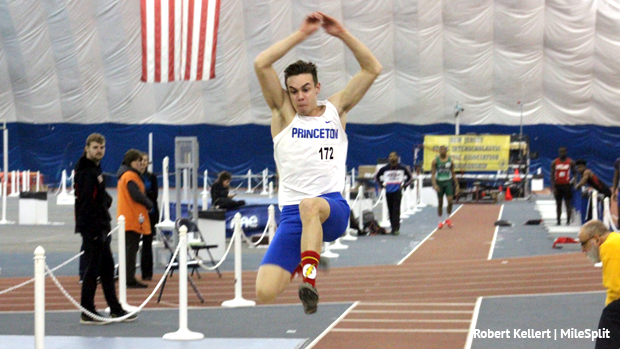 They had three of the top four times this season with wins coming at the Millrose Games and NJCTC Winter Relays.